QUESTION: BitCoin has crashed and it looks like it will never be what people dreamed as some replacement for the dollar. Are bubbles always involving some failed product? A dream that is just unrealistic like the Tulip bubble? ANSWER: No. There have been many, many, many “bubbles” throughout history. 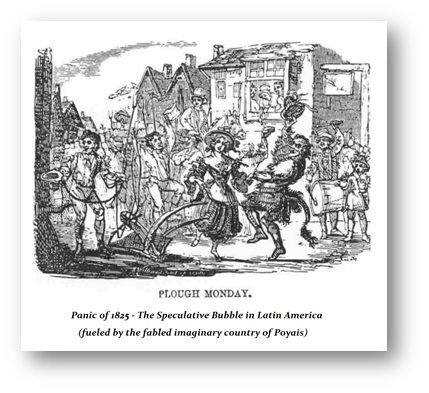 Some have been just crazy like the Tulip Bubble and others have been outright frauds like the Panic of 1825 which was a stock market crash following the same idea as the South Sea and Mississippi Bubble of 1720. This time, it was again a new emerging market country that was completely just a fraud. It was a wild speculative investment in Latin America, that was all about an imaginary country of Poyais. The stock market boom became a bubble and banks caught up in the euphoria made risky loans all on this imaginary new market.